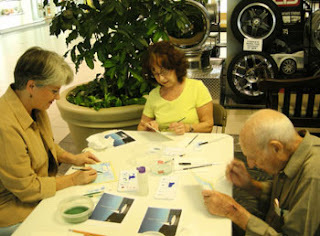 Last week I volunteered to teach seniors a little bit about watercolor painting at the Melbourne Square Mall. As a member of the Art and Antique Studio and Fine Art Gallery, I volunteer here and there to give demonstrations and mini workshops. Once a month the mall holds a Seniors Day and provides bingo, health screenings, informational booths about local services, and little art and craft workshops. I brought in small 5 x 7 inch watercolor pages and some little palettes and brushes. I also brought in a small sailboat photo reference and a little drawing that they could transfer. It took about an hour for each session. I showed them how to transfer the drawing to the paper and how to apply washes to the sky and boat. Each participant took home a little painting. It was a lot of fun! I will be doing this again in February, but we will be painting a small rose, since it will be just before Valentine's Day. For more information about my ongoing watercolor classes click here to visit my website. Classes begin in January!